Set on an isthmus between two scenic lakes, Madison's Central Business District encompasses the heart of downtown Madison, where the famed State Street pedestrian mall links the Capitol Square, seat of Wisconsin state government, to the University of Wisconsin campus. The central downtown is home to more than 1,500 businesses - from shops, boutiques, and restaurants to financial, law and communications firms - plus museums and cultural destinations. Stop at the Downtown Visitor Center year-round, for maps, directions and a friendly smile! The award-winning Dane County Farmers' Market has been a Madison tradition since 1972. With approximately 270 members, the DCFM provides the best of each season's bounty. Downtown Doors is an outdoor gallery on in the heart of the Madison, WI. It isn't summer yet, but we're gearing up for another great run of night markets. The modern design and earthy ambiance evoke a sense of nature and serenity that will surely sooth the traveler’s mind. 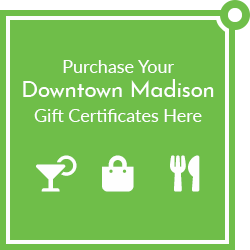 Whether you’re enjoying the panoramic views of Madison from the rooftop pool or socializing over handcrafted cocktails in the bar, AC Hotel Madison Downtown is sure to offer you the essential hotel experience. Between Lake Mendota and Langdon Street, between Memorial Union and the Red Gym, you’ll find a place that celebrates the University of Wisconsin–Madison and its graduates. Not only does Alumni Park give graduates, students, and visitors of all kinds a beautiful spot to enjoy, but it also tells the stories of the university and its alumni and the ways they’ve changed the world. The newly renovated Park Hotel stands as a reflection of Madison's history and growth as a city. The only hotel on Madison’s Capitol Square, Best Western Premier Park Hotel is an icon of hospitality and a true symbol of downtown Madison. City of Madison operated parking lot. Metered. City of Madison operated parking garage. Dane County operated parking garage. Home to the second-largest collection of art in Wisconsin, with permanent collections, temporary exhibitions, education programs and events. Destination Madison is dedicated to creating economic impact through tourism. The effects of our “invisible industry” benefit everyone living in Dane County in key areas including jobs, community services and quality of life. 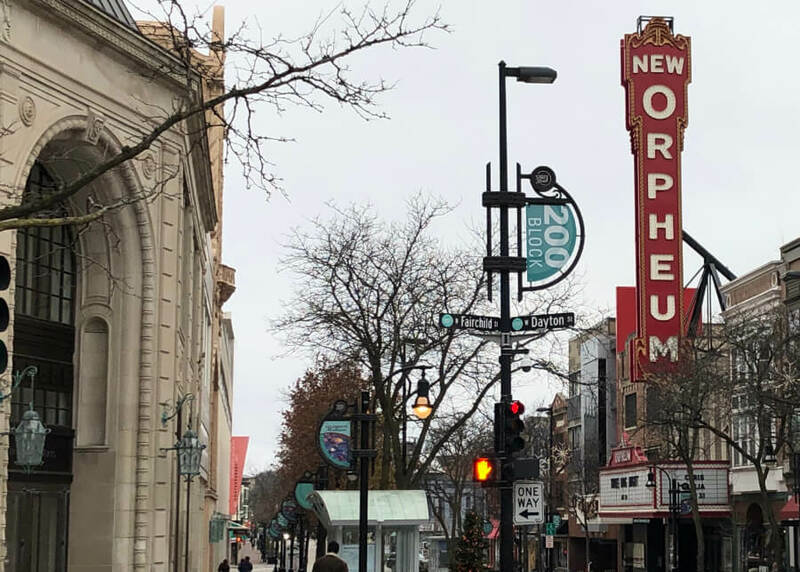 Situated on the University of Wisconsin-Madison campus, we are in walking distance of the vibrant shopping, dining and entertainment district, State Street, as well as other downtown attractions. Experience the legendary atmosphere by catching a game at Camp Randall Stadium or cheering on the Wisconsin Badgers at the Kohl Center. Open from May into October, the Downtown Madison Info Booth is located where State St. meets the Capitol Square. Offering visitor information, brochures, and answering questions regarding downtown shopping, dining, and entertainment. Downtown maps, directions, event information, and shopping and dining suggestions. Two locations: Year-round Downtown Visitor Center in Peace Park at 452 State St., and the seasonal Downtown Information Booth (May-Oct.) where State Street meets the Capitol Square. University of Wisconsin operated parking garage. Boutique hotel near State Street and the UW-Madison campus with two food & beverage outlets open to the public, including a rooftop lounge. Hotel and conference center, connected to Monona Terrace via skywalk. A University of Wisconsin-Extension conference & banquet center and hotel. Fun for children of all ages; hands-on exhibits, creative projects and special events. Independently owned hotel near the State Capitol, State Street and UW Campus. Madison's largest convention hotel. Madison's home for modern and contemporary art. The new Central Library offers expanded facilities plus art exhibits, events, films and hands-on activities for all ages. The principal research facility on the UW-Madison campus for the humanities and social sciences. The social, cultural and recreational center of the University of Wisconsin-Madison campus. Home to the Union Terrace, Der Rathskeller, live events, Daily Scoop Ice Cream, Badger Market, conference rooms, hotel rooms, and more. A public space and convention center designed by Frank Lloyd Wright. Open daily. Rooftop garden, public tours, gift shop, Lake Vista Cafe. Public access parking located at the Monona Terrace. City of Madison operated parking ramp. City of Madison operated parking facility. City of Madison operated short-term parking stalls. Metered. UW-Madison campus and community information and assistance inside the Memorial Union. Info Desks also available at Union South and the Wisconsin Institute for Discovery. One of three University of Wisconsin-Extension Conference Centers. An independently financed, nonprofit alumni organization for UW-Madison alumni. Explore Wisconsin's distinctive heritage and a variety of other American history topics. On Madison's Capitol Square. Society headquarters, library and archives with materials about the history of Wisconsin, the United States and Canada, plus collections of the Wisconsin Center for Film and Theater Research. 120 Martin Luther King Jr. Serves the legal information needs of state officers and employees, attorneys and the public. The Campus Event Services Office (CESO) assists Wisconsin Union members, student organizations and campus departments in planning and coordinating events and campus activities in the Memorial Union, Union South and other campus buildings. It offers event planning; room reservations; food selection, technology and room set-up; and campus facilities and outdoor spaces reservations. Offering instructive exhibits highlighting important events in Wisconsin military history from the Civil War to the present. Stop by the Downtown Visitor Center at 452 State St. or our seasonal Downtown Information Booth located at the top of State Street for information, directions and a welcoming smile.